BUFFALO, N.Y. (AP) — Perfect it wasn’t. The Buffalo Sabres still made it to 10. Buffalo matched its longest winning streak in franchise history, and is enjoying the NHL’s best run since the Columbus Blue Jackets won 16 in a row from Nov. 29, 2016, to Jan. 3, 2017. Very few of the Sabres’ wins have come easily since their last loss on Nov. 4. Nine of the 10 games have been decided by one goal, and this marked the seventh one decided after regulation — and third in a row. Nathan Beaulieu also scored for Buffalo. Carter Hutton stopped the first 32 shots he faced and 36 overall to extend his personal-best winning streak to eight, during which he’s allowed just 15 goals. “We got shut out the other night, but all in all that game wasn’t us. Tonight was better,” Pavelski said. It’s been a night-and-day season for the Sabres, who suddenly find themselves atop NHL’s overall standings, one point ahead of Tampa Bay and Nashville, after both teams lost on Tuesday. 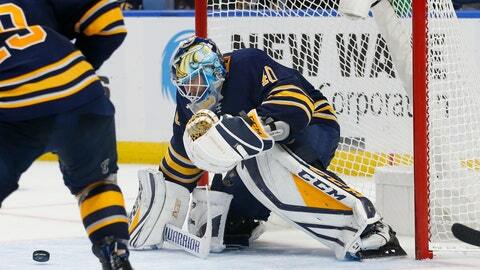 By improving to 17-6-2, the Sabres are eight wins short of matching last season’s total, when they became the NHL’s first team to finish 31st in the standings following the addition of the expansion Golden Knights. Buffalo has also won six straight at home to mark its best streak since a 7-0 run from Nov. 28 to Dec. 15, 2014. The Sabres can even poke fun at themselves, with much of it directed at Ristolainen’s goal celebration in which he stomped his feet and twirled his stick as if it were a lasso. NOTES: After playing at Toronto on Wednesday, Sharks D Erik Karlsson will make his first return to Ottawa on Saturday since the Senators traded their former captain and two-time Norris Trophy winner to San Jose in September. … Kane received mostly a warm welcome upon being introduced early in the first period in his first game in Buffalo since the Sabres traded him to San Jose in February. … Sabres LW Conor Sheary missed his first game with an undisclosed injury, a day after leaving practice early.